A friends family stayed with us for some days a few weeks ago and her mom who was visiting her from India made this sandwich one day. And we all loved it. Mix Aloo , onion , tomato, chili, chat masala , garam masala , jeera powder and salt. Spread butter on one side of each slice. Spread green chutney on other side 6 slices. Spread a layer of aloo mix on other side of remaining slices. Cook on a griddle or pannini maker on both sides till golden. 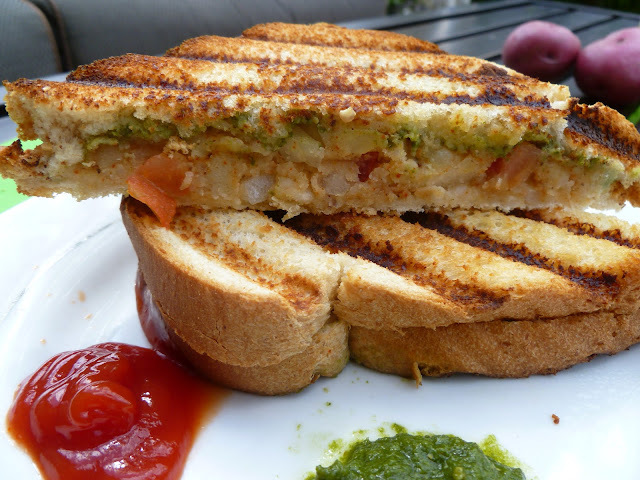 wonderful n yummy sandwich...looks tempting!! Drooling rite now here..my fav sandwich. looks colourful and neat presentation..
always my favorite!! !loved the stuffing !!!!!!!! yummy sandwich with healthy filling.. Perfectly made with tasty filling. Thx for linking.